To begin article highlights from our latest edition of Culture, Medicine, and Psychiatry (Vol. 41, Iss. 1), this week we are featuring Christine El Ouardani’s Innocent or Intentional? : Interpreting Oppositional Defiant Disorder in a Preschool Mental Health Clinic. This article examines contradictions clinicians face when attempting to identify and interpret “intentionality” in young children with oppositional defiant disorder (ODD). El Ouardani argues that conceptualizing intentionality as a developmental, interpersonal process may help to make sense of the multiple discourses and practices clinicians use to try to reconcile the contradictions inherent in diagnosing ODD. El Ouardani begins by introducing “Carla,” a three-year-old who arrived for evaluation and clinical diagnostic determination at the Preschool Behavior Disorder Clinic (PBDC). At first Carla appears as any typical preschooler, energetic and affectionate, but the care team quickly learns she would frequently have violent outbursts and tantrums, lashing out at her family members, other children, or even nearby animals. This type of aggressive, disruptive behavior represents the main reason for the referral of preschoolers to mental health clinics. Early intervention into and treatment of such behaviors is thus of great interest to researchers and clinicians in the field of child mental health care in hopes of helping the young children adapt and cope with life more effectively and prevent the development of later, more destructive behaviors. El Ouardani discusses that many of the children seen in the PBDC were given a diagnosis of oppositional defiant disorder (ODD), defined in the Diagnostic and Statistical Manual IV (DSM-IV) as “a recurrent pattern of negativistic, defiant, disobedient, and hostile behavior toward authority figures that persists for at least 6 months” that impairs a child’s social and/or academic functioning. Yet with very young, preschool-aged children, the diagnosis is controversial. Many children displaying aggressive behavior come from chaotic or otherwise problematic social environments in which this kind of behavior is a reasonable reaction. El Ouardani states that clinicians “must reconcile their characterization of disruptive behavior as a matter of ‘self,’ with the social environments that seem to be producing this kind of behavior.” El Ouardani also draws attention to the values and assumptions of current treatment models and diagnostic procedures. These modules are often based on white, middle-class norms of a “proper” family, moral assumptions of how parents should discipline their children, and the assumed role of a child in social institutions. Many patients at the PBDC did not fall into those characterizations; the reality of their lives are much different. Moving to a discussion of agency and intentionality, El Ouardani then examines the biomedical, disease model of mental illness, which attempts to remove the blame for the illness from the individual. “Ideologically, then, those afflicted with mental disorders bear no responsibility for the behaviors that directly result from their disorders,” El Ouardani writes, since the biological processes of mental illness are taken out of the patient’s control. Thus, ODD as a category defined by “intentional” defiance conflicts with the disease model of mental illness. “A central concern of psychiatric therapeutics is to motivate and use the intentionality of a patient to regain control over the self.” Yet the idea that preschool-aged children are fully capable of acting with this type of intention, and possess the capacity to do so, is disputed. Therefore clinicians diagnosing a young child with ODD are forced to face the disparities between what is out of the child’s control, and what is the “will” of the child. El Ouardani discuses that determining intentionality is a complex process, especially because of a child’s limited verbal capacity for expressing internal states. “In order to identify intentional defiance and diagnose ODD, clinicians had to delineate authentic displays of emotion from those that are inauthentic and manipulative.” El Ouardani explains that nuanced, intersubjective exchanges between the children and the clinicians are not captured within the DSM-IV diagnosis. Clinicians often feel frustrated when they perceive a child is trying to manipulate them. This can be compared to clinicians stating “that they feel bad for children with depressive symptoms. They theorized that disruptive behavior in depressed children is a way to cope with internal pain.” This difference means the clinicians feel less personally attacked by children without the ODD diagnosis, becoming less frustrated. Further, by diagnosing a child with multiple disorders the clinicians can discursively split the child’s “self” into different intentional and non-intentional parts. However, this leads to ODD being categorized as a feature of the individual’s character, who that child is as an individual, rather than as a biological disease. Explanations for why a particular child’s behavior were not always attended to within the PBDC. “Clinicians tended to rely upon the widely accepted idea that behavior and psychopathology is a result of interactions between biological temperament and the social environment. According to this model of developmental psychopathology, innate temperament interacts with problematic interpersonal relationships and chaotic household environments, causing the child to react to these negative circumstances with disruptive behavior.” Yet this strategy still leaves ambiguities over etiology and treatment. Dr. Christine El Ouardani is an Assistant Professor in the Department of Human Development at California State University, Long Beach. She is a cultural, medical, and psychological anthropologist who focuses on the anthropology of childhood and lifecourse in Morocco and in North America. El Ouardani’s current book project, Discipline and Development: Negotiating Childhood, Authority, and Violence in Rural Morocco, examines the everyday lives of children and youth in a Moroccan village as they move through their families, classrooms, and medical clinics. She analyzes disciplinary interactions between children and caretakers in their extended families and local schools that were often both violent and playful, demonstrating how local conceptions of authority, care, pain, and violence are constructed and enacted in everyday life at different points throughout childhood, and in different institutions. El Ouardani shows how examining the nuances of child socialization practices over time and children’s roles in family and community life provides a sharp lens through which to consider larger-scale political, economic, and social change, in this case, contested norms of authority and violence in Moroccan families. For more information, visit her information page on the Department of Human Development, California State Universtity, Long Beach, available here. When a new issue of Culture, Medicine & Psychiatry is released, we feature a series of blog posts that highlight these latest publications in our journal. 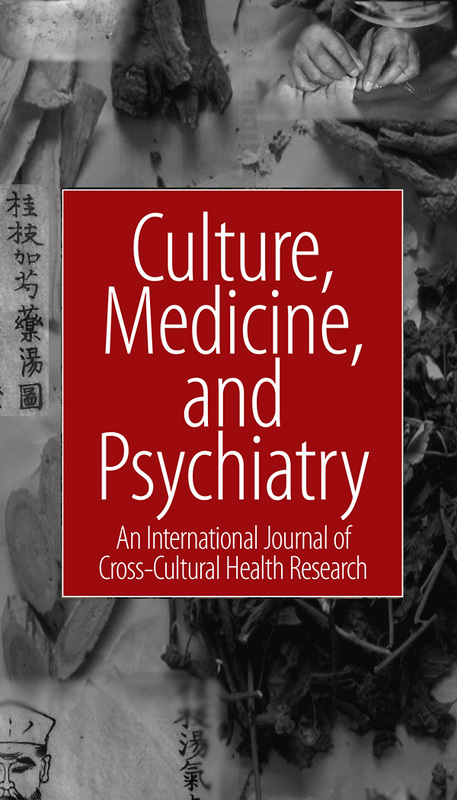 The current September issue includes articles that address psychiatric conditions and the experiences of people with mental illness across cultures. Readers may access the full issue at Springer here: http://link.springer.com/journal/11013/39/3/page/1. In this issue highlight, we will discuss an article on ethnographic analyses of suicide and distress amongst three communities in northern Kenya. The authors of this article strive to establish a nuanced and ethnographically rich understanding of suicide and mental distress in an under-studied population of three distinct, yet interacting, pastoral communities in northern central Kenya. These three groups– the Pokot, Samburu, and Turkana– are engaged in intercommunity conflicts over territory and land use agreements, despite the communities’ shared and entangled oral histories. Such tensions are only exacerbated by mutual fear of raids by other groups, dearths in food available for forage, and the theft of livestock from individuals who sell the animals to finance political campaigns. Poverty is likewise aggravated by these patterns of loss and violence. This turbulent social environment creates widespread mental distress amongst the three communities, yet individuals from each group stressed to the research team that they felt obligated to persevere despite these pressures, making admitting psychological suffering (and especially confessing thoughts about suicide) deeply taboo. Therefore, any mental health intervention would have to be responsive to the extent to which Pokot, Samburu, and Turkana culture disallow individuals from discussing or even thinking about suicide: an act which could create even more social strain on the family of the person who committed it. The researchers confirmed this inability to discuss suicide by the high rates of non-response on a survey question which asked participants whether or not they had experienced suicidal thoughts. Suicide thus proves to be a unique case for anthropological analysis because it is both driven by the social conditions of those who take their own lives, as well as disruptive to the communities in which these people lived. Its treatment by global health workers must in turn be sensitive to cultural beliefs that forbid conversation about suicide, especially in communities where the death of an individual may contribute to already extraordinary social distress. Culture, Medicine & Psychiatry’s second installment of the year arrives June 2015. This special issue will address anthropological studies of autism throughout the world. To give our readers a preview of the upcoming issue, special issue guest editor M. Ariel Cascio, PhD joined our social media editor for an interview to discuss compiling the issue, what topics the articles will address, and new themes in the study of autism. Can you tell us a little about the upcoming June 2015 special issue? The special issue, “Conceptualizing autism around the globe,” shares anthropological (and allied field) research on autism in Brazil, India, Italy, and the United States. We talk about “conceptualizing” autism as a way to counter the idea that autism “is” or “means” one specific thing. Sometimes autism means the diagnosis measured by a certain instrument (such as ADOS), sometimes it means a more broadly defined set of characteristics (such as those in the DSM), sometimes it means an individual identity, and so many more things. The articles in this issue explore how autism is conceptualized at several different levels: in national policy, in treatment settings, and in the home. What’s been your favorite part of working on the special issue? I’ve just enjoyed the opportunity to greater familiarize myself with the group of scholars who are pursuing the anthropology of autism, and to work alongside scholars whose work I have long followed. So how did you become interested in the study of autism? I’ve been studying autism since 2008. I actually came to anthropology before I came to autism, and when I first began learning about autism, I saw it as rich for anthropological inquiry (isn’t everything!) because of anthropology’s strengths in focusing on lived experience, challenging deficit narratives of so-called “disorders,” and placing medicine and psychiatry in sociocultural context. What was it like doing fieldwork in Italy? How do Italians see autism differently than other places in the world? I’ve studied the autism concept more in Italy than in any other place in the world, and I’m very grateful to everyone there from whom I learned – autism professionals, family members of people with autism, and people on the spectrum themselves. I could hazard comparisons with the literature that address perceptions in other parts of the world – and some of these comparisons come through in the special issue – but for now I would like to focus on the strength of the rich description of the Italian context without external comparison. As my article in the special issue shows, autism professionals tended to take a social model of autism, focusing on creating environments that were tailored to the needs of people on the spectrum and structured to help them learn. What are some of the challenges you’ve faced in studying autism? As in many areas of inquiry familiar to readers of CMP, it can be challenging to communicate information about my study to people who study autism in other fields (clinical, psychological, social work, etc.). A lot of research about autism takes a positivist stance, whereas my research takes an interpretivist stance and focuses on autism as a concept whose meaning may vary rather than a diagnosis measured in a particular way. Nonetheless, I love talking about my research interests with a broad audience because in many contexts (especially in the U.S.), so many people have personal or professional interest in autism and we can always have interesting and stimulating conversations. What’s something you think would surprise non-anthropologists about the anthropology of autism? I would imagine non-anthropologists would be surprised by the anthropology of autism for the same reasons they might be surprised by anthropology (or medical anthropology) in general. For example, they might be surprised that anthropologists study autism all over the world, particularly if they think of the autism concept as something that represents a universal set of characteristics and experiences that are unaffected by context. The articles in this special issue really show that context matters in all conceptualizations of autism, from Brazil to the United States, from national policy to the family home. Where do you see the anthropology of autism heading next? I see the anthropology of autism becoming more inclusive. In her commentary, Pamela Block expresses optimism that the anthropology of autism will increasingly include researchers who identify as autistic themselves, and I agree. In addition to including more researchers with autism, I anticipate that the anthropology of autism will increasingly work to include participants with higher levels of support needs (those whom some people call “people with low-functioning autism”), and delve deeper into their lived experiences as well. Many thanks to Dr. Cascio for sharing her insights! Look for the special issue on conceptualizing autism in June 2015, and be sure to check back for more previews of the issue, article features, and other blog entries about the new installment here on our website.